The traditional margarita—tequila, orange liqueur and fresh lime juice—is the #1 selling cocktail in the U.S. It has inspired many twists on the classic recipe. Today’s twist comes from popular New York City restaurant, Rosa Mexicano: the Margarita Francesa (French Margarita), using the popular French orange liqueur, Grand Marnier. The recipe was originally developed in honor of the 25th anniversary for National Hispanic Heritage Month (September 15 to October 15, 2011). We’re making it for National Margarita Day, February 22nd. This French-Mexican Margarita reverses the amount of spirit ingredients from a traditional Margarita for a more vibrant taste. The result, says Rosa Mexicano, is a profile that is smoother and more balanced with the enticement of the citrus notes and the complexity of cognac found within Grand Marnier. 1. Rim a glass with coarse salt. 2. 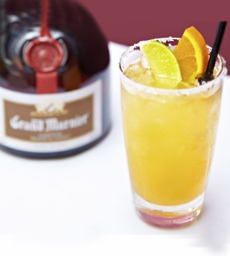 Combine Grand Marnier, tequila, lime juice, orange juice and simple syrup in a cocktail shaker filled with ice. 3. Strain into a tall glass with ice and garnish with an orange wheel and lime wedge.